This summer I had the pleasure of working with Professors Kurtis Schaeffer and Charles Mathewes to run the National Endowment for the Humanities-funded Summer Institute “Problems in the Study of Religion.” Each year, the National Endowment for the Humanities (NEH) strengthens the American study of the humanities through funding dozens of summer workshops, seminars, and institutes, which bring together university and secondary school educators to discuss pressing issues in their fields. After their successful 2011 NEH-funded seminar on a similar theme, Professors Mathewes and Schaeffer wanted to continue the rich conversations and intellectual development through sponsoring a larger summer institute at the University of Virginia. We accepted 25 faculty and upper-level graduate students from across the country to participate. Professors Schaeffer and Mathewes were committed to creating an interdisciplinary space which nurtured voices from across the humanities—not merely those from the field of religious studies. To that end, almost half of our accepted participants were from fields and departments outside of religious studies, including anthropology, political science, English, area studies, and environmental studies. This wide mix and diversity was a huge success in generating an enthralling and compelling dialogue throughout the three weeks of the institute. As a field, religious studies has much to gain from its colleagues throughout the humanities (and beyond), and one the greatest pleasures of the institute was developing academic connections and conversations across disciplines. Our first week focused on the problem of the category of religion—and its necessary opposite, the secular. We began with Brent Nongbri’s recent work Before Religion, which looks at the concurrent development of the concept of “religion” with the concept of “secular.” We delved deeper into this topic through examining Talal Asad’s Formations of the Secular. Our final week concluded with Saba Mahmood’s Politics of Piety. The majority of participants concluded that Mahmood’s central claims have been accepted by most scholars of religion and, therefore, perhaps generate less controversy than they once did; however, it was generally agreed that her work still provided an excellent resource for upper-level undergraduates and early-career graduate students. 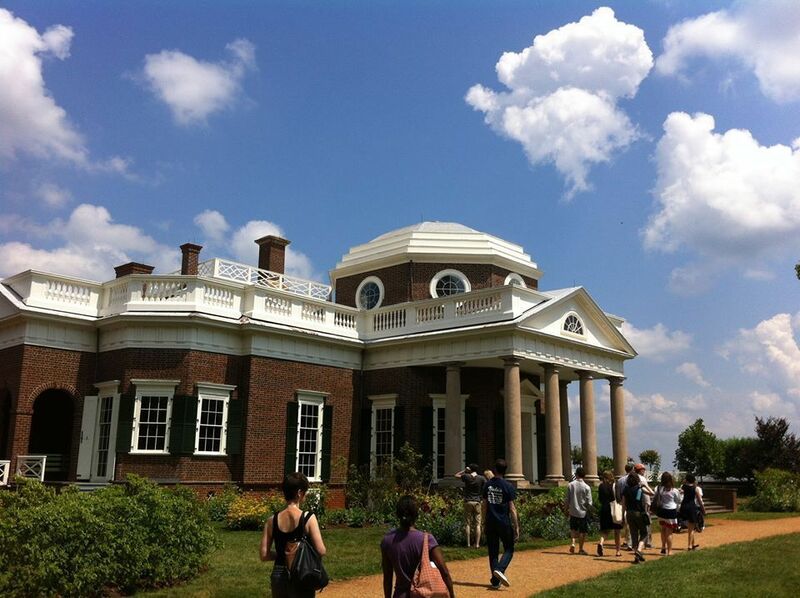 Our week ended with a trip to the nearby Monticello where we were able to explore the founder of the University of Virginia Thomas Jefferson’s complicated relationships with slavery, religion, and the intellectual currents of his day. In our second week, we delved into the trending topic of the relationship between science and the humanities, beginning with a critical reading of Edward Slingerland’s book What Science Offers the Humanities. Slingerland’s call for a deeper engagement with the embodied nature of human experience was well-received, but the at-times polemical nature of his work was noted by almost all participants. We next read Ann Taves’ Religious Experience Reconsidered and were fortunate enough to welcome Dr. Taves to the university to speak with us about her work. Her visit was the highlight of the summer institute for many participants, and allowed participants to refine their understanding of her theory—particularly her idea of “specialness” and “special things.” Robert Bellah’s Religion in Human Evolution closed out our second week, where we all greatly benefited from the expertise of Heather Ohaneson, whose own research centers on play—a crucial component of Bellah’s argument. Our final weekend together was busy with a tour of James Madison’s Montpelier and a trip to the nearby town of Staunton to attend a play at the American Shakespeare Center. Our third week focused our attention on pedagogy and how to approach religion in a classroom setting by inviting back two participants from the 2011 seminar. After reading Kevin Schilbrack’s Religion and Philosophy: A Manifesto, we welcomed Dr. Schilbrack to speak with our participants. Dr. Schilbrack’s invitation to incorporate critical evaluation of religious truth claims into some classroom settings inspired several participants to reevaluate how they approach teaching about religious traditions and how the techniques used by philosophers of religion can benefit their pedagogy. We next read Tyler Roberts’ recent work Encountering Religion, which speaks to the central importance of encountering the other in classrooms through the study of religion in order to deepen our understanding of the totality of human experience. Several participants explored the complications of encountering an other who is distasteful or painful with Dr. Roberts himself when he came to speak with us about his work. We closed our final week by reading the recent volume edited by Christopher Lehrich of J.Z. Smith’s essays On Teaching Religion. Many participants discussed Kathryn Lofton’s recent impassioned critique of J.Z. Smith as a pedagogue and Russell McCutcheon’s vigorous response in the pages of JAAR. In fact, Russell McCutcheon—who was an invited speaker to the seminar in 2011—was a specter throughout the institute; in nearly every conversation, his name or work was brought up to critique or support the book under discussion. Although pedagogy was an explicit focal point only on the final week of our institute’s syllabus, it was a frequent theme throughout nearly all of our conversations, initiated particularly by Annie Blazer, Elliott Bazzano, Beatrice Marovich, and Ata Anzali. Our institute’s interest in pedagogy was particularly supported via three participant-led pedagogy sessions, which allowed participants the opportunity to share their own experience in the classroom while also expanding their repertoire of pedagogical tools. The pedagogy workshop around the insider/outsider question was especially spirited, thanks to the thoughtful comments of Elliott Bazzano, Audrey Truschke, and Jayme Yeo. While this note-worthy institute-wide interest in pedagogy possibly reflects the interests of this particular group of participants—many of whom were early-career scholars—it is my hope that it also signals a critical turn in the field of religious studies as a whole. In my experience, a specific and sustained interest in implementing effective pedagogical training for many early-career scholars and graduate students has been a largely secondary focus in religious studies departments and the academy more broadly. In light of the pressure faced by department chairs, graduate advisors, and faculty leaders to justify their existence within the larger academic system, such pedagogical training will not become a priority unless specifically and vocally requested by early-career faculty and graduate students. These pedagogy seminars were particularly valuable occasions to discuss what we do when we teach religion, and I hope that both our NEH summer institute participants and others will continue to inspire such conversations across the academic community. Kurtis Schaeffer and Charles Mathewes hope to have the opportunity to again lead a similar NEH-funded summer institute in the future, and we eagerly hope many other scholars will consider applying to participate. This entry was posted in Natasha Mikles, Religion and Theory, Scholarship on the Road, Theory and Method, Uncategorized and tagged Ann Taves, Brent Nongbri, Charles Mathewes, Christopher Lehrich, Edward Slingerland, Heather Ohaneson, J.Z. Smith, Kathryn Lofton, Kevin Schilbrack, Kurtis Schaeffer, National Endowment for the Humanities, Robert Bellah, Russell McCutcheon, Saba Mahmood, Talal Asad, Tyler Roberts, University of Virginia. Bookmark the permalink.